The task before me is not an especially pleasant one. I am asked to write a review of a production from one of my very favorite theatre companies: the always-wonderful (well almost always) Masquerade Theatre. The current production there has a title that may have been part of the reason there were plenty of empty seats at last night’s Opening Night performance of the satirical musical, Urinetown. I admit I had some hesitations about attending myself, but I have such longstanding faith in Masquerade’s offerings that I headed in to Houston with high hopes. This was a show that I never got around to seeing in New York, and it ran on Broadway for over two years. So maybe I am missing something in its allure. Let me say up front that I don’t think the major blame lies with Masquerade, though director, Phillip K. Duggins, made the choice to present the show. Rather the bulk of the blame should reside with the originators who created a musical with generally unappealing music, limited dancing, dim lighting, gritty looking costumes, and an essentially bare stage set, save for some elevated ramps and a brick toilet building center stage. Get the picture? The unusual plot takes us into a future world where water is in short supply and a major corporation, Urine Good Company (pun intended), has gained total control of toilet facilities where everyone must line up and pay for the use of “public amenities,” because private toilets are not permitted. The company C.E.O. of UGC is Caldwell B. Cladwell. With plenty of bluster and disdain for the common folk, Mark X. Laskowski plays Cladwell, and along with co-conspirators, Senator Fipp (Tyler Galindo), and his office lackey, Mr. McQueen (Tyce Green), they remind one of the boardroom nonsense of, How to Succeed in Business Without Really Trying, as they all sing Cladwell’s praises in a high-stepping chorus line. Pretty Libby Evans plays Cladwell’s cute and spoiled daughter, Hope. 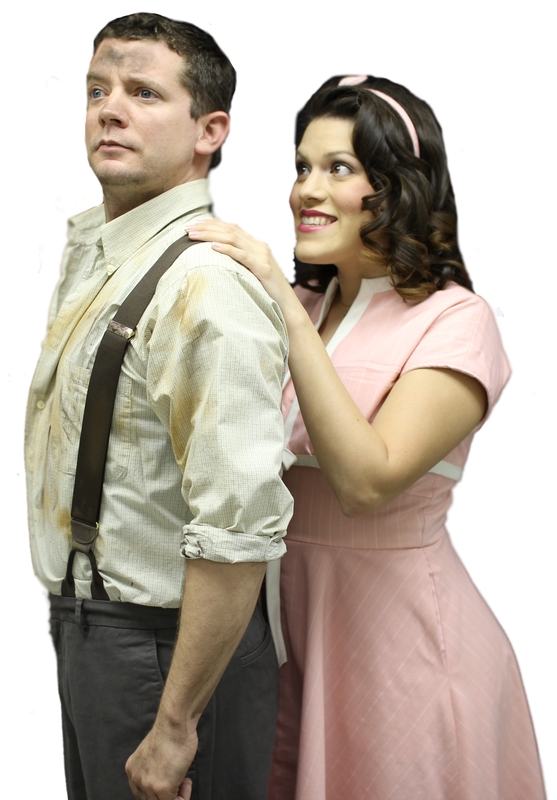 She develops a bit of a crush on toilet attendant, Bobby (Michael J. Ross), who begins leading a populist rebellion against pay toilets after his dad (Adam Delka) is carted off to the dreaded Urinetown for having peed in public without paying the requisite fee. Allison Sumrall plays Penelope Pennywise, Bobby’s warden supervisor at the toilet. We learn that Penelope at one time “had a thing” with old man Cladwell and thereby is actually Hope’s mother. Guiding us along this unsavory journey is Police Officer Lockstock, with a clever, tongue-in-cheek performance from talented Luther Chakurian. Chakurian’s solid voice and sense of satire work quite well as he frequently steps out of character to “break the 4th wall” while humorously addressing the audience directly. Lockstock and his partner, Officer Barrel, played by Rodrick Randall (Get it? Lockstock & Barrel? ), are charged with keeping the masses in line (literally) as they queue up to use the toilet. I bet you readers think I’m making this up, but that responsibility rests with Mark Hollmann who wrote the music & lyrics, and Greg Kotis who wrote the book and additional lyrics. Those boys are probably laughing all the way to the bank. Who could blame them? With musical direction from Michael J. Ross, conductor, Richard Spitz, led the small onstage band beginning with a “Prelude” that sounded a bit like a triumphal march, and then moving on to the ensemble’s rousing opener with the title tune. Perhaps it was one of the band’s amplifiers that emitted the annoying persistent hum that would continue throughout the performance. With her powerful voice, Sumrall extends the show’s bizarre premise in her opening “aria” of “Privilege to Pee,” followed by Chakurian’s thunderous reprise of that tune. The guest who accompanied me felt the rowdy “Cop Song” from Lockstock and his fellow police officers was a favorite moment in the show. For me it was the gospel style flavors of a number called, “Run, Freedom, Run,” which was well staged (in spite of the fact much of the lyric was unintelligible), and featured an amusing bit with an onstage healing that goes awry. More successful was the clenched fists-in-the-air rebellion of the toilet-restricted mobs, which seemed oddly timely in view of recent events in the Middle East, especially when a line in Act Two reflects on how, “The good guys take over, and then everything starts falling apart.” Other songs bordered on the annoying as in the case of an unsatisfying duet from Bobby and perky Hope, with “Follow Your Heart,” Mr. Ross’ poor rendition of the lackluster song, “Look at the Sky,” or Act Two’s full company tirade of “Snuff that Girl.” I would snuff that song. There were moments that amusingly parodied classic musicals as with the Act One finale featuring the iconic and flag-waving revolutionary imagery of Les Misérables, or the Cossack dancing of Fiddler on the Roof. And speaking of amusing, Catherine Taylor was all of that as the whiny, teddy bear-holding little girl, Sally, who seemed for all the world like a Lily Tomlin character from days of yore. This entry was posted in Miscellaneous Reviews, Other Newspaper Columns, The Courier Columns, Theater Reviews and tagged Entertainment, Houston, musicals, Reviews, Texas, theatre. Bookmark the permalink.